and Archbishop Dr. Karl Rodig, ECCC, the Cathedral’s pastor. "Long time FCM member, Rev. 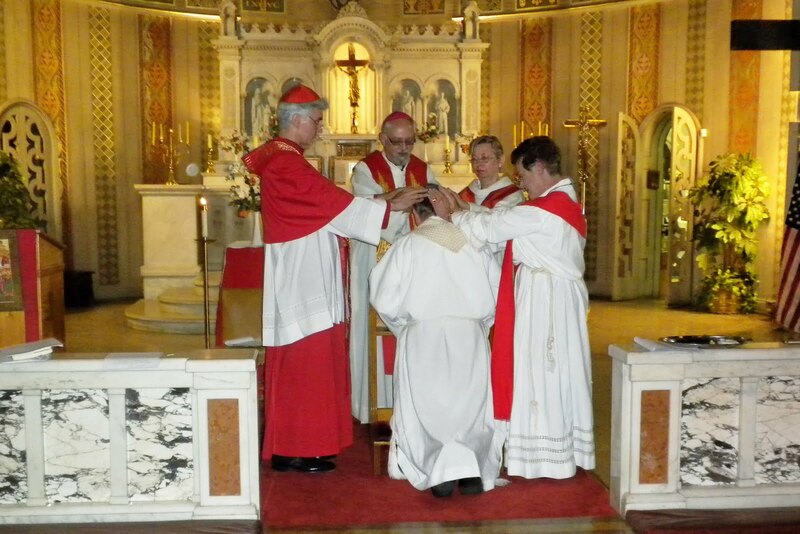 Dr. William J. Manseau has been consecrated a bishop in the Roman Catholic Church! This took place by authority of the Married Priests Now Prelature initiated by Archbishop Emmanuel Milingo, a Roman Catholic bishop who has married as a member of the world wide movement for a married priesthood catalyzed by Vatican Council II. While recognizing that such an action, while valid, is “contra legem” or contrary to ecclesial law, it is done as an act of conscience and faith in the belief that the law is impeding the life of the Church and as such violates the supreme law of the Church which is the salvation of souls (CJC, can. 1752) and need not be observed. The momentous event occurred on Saturday, June 11, 2011, the eve of Pentecost, in the St. Barnabas Chapel at the Cathedral of St. Anthony in Detroit, Michigan, the Gateway to Freedom City. Archbishop Peter Paul Brennan of the Prelature was the presiding consecrator and was assisted by Bishop Christine Mayr-Lumetzberger, RCWP, from Austria, Bishop Andrea Johnson, RCWP and Archbishop Dr. Karl Rodig, ECCC, the Cathedral’s pastor. I am delighted that, Bill, a dedicated minister of the Gospel, is now a bishop. He will be a great blessing to Catholics especially those of us who are working for the reform and renewal of the Catholic Church. I am hopeful that Bishop Manseau will offer married men, called to serve a faith community as priests, a path to fufill their vocation within the supportive network of married priests who have had years of experience in parish ministry and who left because of the celibacy requirement. What a powerful charism and great opportunity for wisdom sharing! It is significant that Roman Catholic Women Bishops, Christine Mayr-Lumetzberger and Andrea Johnson participated in the ordination rite. The Roman Catholic Women Priests Movement is blessed as we collaborate with bishops, like Bill and Married Priests Now, on our journey in an inclusive priestly ministry in a community of equals. We are kindred spirits in the transformation of our beloved church as together we live Gospel equality now! "A lawsuit filed Tuesday by a former Catholic high school teacher claims he was fired because he pushed for an investigation into a priest who pressured teenage girls to tell him about sexual details during confession held at the school. Former Bishop Verot High School teacher Chris Wilson is seeking damages in excess of $15,000 after he says he was fired for seeking an inquiry into the behavior of a priest. Former Bishop Verot High School teacher Chris Wilson is seeking damages in excess of $15,000 against the school, the Diocese of Venice and Bishop Frank Dewane, who oversees the priest in question." "According to the suit, Dewane used his "power and position" to have Wilson fired as "punishment, retaliation and a lesson to others similarly situated within the Venice Diocese." ...." can anyone doubt that women priests would be less likely to protect their deviant peers?Just as Pope Urban silenced Galileo but not his truth, Rome today has banned discussion of a female priesthood. Yet the “sense of the faithful” has moved beyond the sexism and sexual dread of Church leadership." "Bishop Finn, your people are angry. Your many good priests are humiliated. I do not call on you to resign or to implement weak reforms of the current system. I call on you to speak out for sweeping reform of the priesthood — for women’s ordination and optional celibacy. That would be more powerful than any apology." Holy Sacred Spirit, breathe your life in us." Breathe in God's Presence that surrounds you, is within you, and is moving through you with every breath you take. Every day is a miracle. "The first time the Rev. Charles Murphy was cleared of accusations that he improperly touched a minor, a girl 25 years earlier, everyone who ever met him said they had never doubted his innocence. It was 2006 and priests were all over the news for every awful reason, most of them deservedly so. But Father Murphy swore his innocence, the archdiocese ruled the allegations lacked substance, and the woman dropped her suit on the eve of trial." It is important that the process for handling complaints is transparent and just. The testimony of Fr. Murphy's parish speaks volumes for the supportive role that the Catholic parish can and should play in the healing process for a priest who is innocent and suffered so much. Justice for victim and accused is essential in the process. That is one reason why a review board is necessary. The U.S. bishops coverup and Vatican mishandling of the global sexual abuse crisis is the debacle that has inflicted so much damage on the Catholic Church and broken the hearts of thousands of innocent victims. It also has destroyed the credibility of the institutional church. And the people now must take action and hold the Vatican and bishops accountable. Just when will we ever learn? Bishops Squandered Opportunity, Time for Bishops Accountability. Specifying that "any bishop who abuses a child or enables the abuse of a child, or has done so in the past" be reported to civil authorities, not the papal nuncio as the bishops' revisions propose. Bridget Mary: Kudos to the courageous people at Bishop Accountability for speaking truth to power and calling for genuine reform of our broken system in need of systemic change in the Catholic Church now.